Sagittal T2-weighted MRI of the lumbar spine demonstrates a large disc herniation at L5-S1 (red arrow) which completely effaces the central spinal canal. Image source. Lower back pain (also called “lumbago”) is one of the most common medical problems in the United States, affecting up to 40% of all people at some point in their lives. According to the National Institutes of Health, Americans spend at least $50 billion each year on low back pain, and it is the most common cause of job-related disability and a leading contributor to missed work. Back pain is the second most common neurological ailment in the United States — only headache is more common. Most often, lower back pain (LBP) is idiopathic, meaning a specific cause is not able to be identified. In these cases, muscle and joint strain or sprain are assumed to be the etiology. Typically if symptoms persist after a period of conservative treatment (rest and physical therapy), further testing is done which most commonly consists of spine imaging. After plain films of the lumbar spine are obtained, MRI of the spine is the ideal imaging test of choice for lower back pain due to its excellent soft tissue contrast and ability to delineate the vertebral bodies, intervertebral discs, facet joints, spinal cord, and cerebrospinal fluid in the subarachnoid space. Identifiable causes of lower back pain which are diagnosed by radiologists include vertebral body compression fractures (commonly due to osteoporosis), degenerative disc disease, disc herniation (see image above), and metastatic disease, among others. 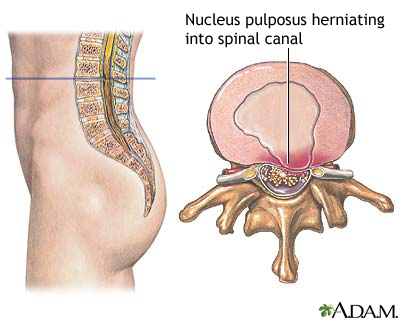 Herniated discs occur most commonly due to normal aging in which the outer part of the disc, called the annulus fibrosis, weakens and subsequently the central portion of the disc, called the nucleus pulposus, herniates through the annulus into the spinal canal or neural foramina. Disc herniations can be treated by surgery or also conservatively with rest and physical therapy, and they have been shown to resolve spontaneously over time without surgery. Most notably, Tiger Woods underwent microdicectomy for a disc herniation that apparently was causing compression of a nerve root.